Summary : A superb peppermint tea that will literally knock you out of your shoes with its strong peppermint aroma and taste. Review : Do you like Peppermint? Do your dreams consist of candy canes hung on a christmas tree? Or savoring the sweet taste of a peppermint life saver? If so, take heart, you are not alone. I adore peppermint. Few things provide more pleasure in life than munching on a peppermint life saver or sipping a fine peppermint tea (yes, its true - some people say I have no life, but that is another story for another day). The beauty of peppermint is that it can satisfy the sweetest of sweet tooths (such as mine). And in a tea, peppermint tea not only satisfies the sweet tooth but also keeps the weight off too! All in all, a perfect combination. And so, when I found myself with a Herbal Peppermint Tea sampler from Adagio Teas I was quick to open up the well packed tin and give it a try. I knew immediately upon opening the tea I was REALLY going to like it. You see, the aroma of this peppermint tea is strong strong - so "pepperminty" - that it will nearly knock you off your feet. 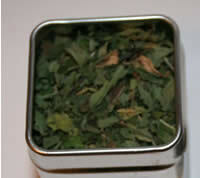 The peppermint tea I received from Adagio Tea arrived, like all their samplers, in a small, metal tin. The tin prevents one tea from contanimating other teas that happen to be in the box or in your kitchen cupboard. And with this peppermint tea, it is a very good thing that they pack it so tightly - otherwise the smell of peppermint would invade every single corner of the box, your cupboard and, eventually, your whole house. Of course, this is not necessarily a bad thing - the smell of peppermint is absolutely wonderful. But even me, who can't get enough mint in my life, probably doesn't want to taste peppermint in my green tea! This peppermint tea from Adagio Tea needs to be brewed for a bit longer than most teas you'll find. They recommend a 7 minute steep time - a time I fully agree on. As such, when steeping the tea, throw a tea cozy or, if you don't have one, a kitchen towel over the tea pot so that the tea will stay warm during the brewing process. Once the tea has been fully brewed, you'll be greeted by a very colorful, light tan colored tea. A tea that, even once fully brewed, still has an aroma of peppermint - always a good sign! What about the taste you ask? Do you even need to ask it? The tea tastes like peppermint - what else? And this particular peppermint tea has a strong taste of peppermint, too - not like some wimpy, third-rate bagged tea varieties that you can find that have been sitting on a grocery store shelf since the last ice age. And the after-taste - oh my - what an after-taste! The peppermint flavor in the tea just lingers, and lingers and lingers. After drinking a cup of this peppermint tea, you'll have peppermint on your taste buds for an hour after you finished - the tea is that strong and that good! So take heart all you peppermint lovers in the world today. If you have been searching the world over for a strong peppermint tea that actually tastes like peppermint, your search is finally over. That all said, if you do not like a strong, relatively sweet tea - I would stay away from this one - as the sweetness and strength of this tea just might knock you out of your shoes. Recommendation : Absolutely and positively - one of my favorite teas and an awesome tea for anyone who likes peppermint! Brewing Instructions : Use one teaspoon (probably a bit more, since the peppermint leaves are quite large) of tea leaves. Pour 1 cup (5.5 ounces, but 6 works quite nicely) boiling water over the leaves. Let the tea brew for 7 minutes. Enjoy.